“Undying Light” is the fourth full-length record from Fallujah, released on March 15th. This album delivers a more stripped down, progressive aggressive approach towards technical death metal with a sound that is probably more dry and not as processed as you’d expect in this genre. From the first to the last song, the music is harsh and visceral but it doesn’t take away from the clarity of each instrument and still feels very much on point, allowing all the details to come through and not have anything lost in the noise. The songwriting is clever and original, keeping the listener interested through every step of the way with unpredictable moments as well as more hooky patterns. For anyone who has heard of this band before, there’s no need to even mention that the technique is exceptional. Every instrument has its moments in the spotlight and they all display serious skill in playing difficult and progressive passages without straying too far away from the musical relevance. They keep everything in line with the emotion intended and by the time the album is over you really have a clear image about what they wanted to say. A remarkable play of cymbals, strums and fills intersected with very fixed and structured drum rhythms puts together a solid yet volatile backbone. This allows the guitars and bass to fiddle around and experiment with riffs that are both dynamic and impactful but also very unusual and intricate at times, giving a sense of constant movement in the sound. There are also brief but very expressive moments where guitar leads come through, once again putting together challenging technique and emotion. And with a use of clean guitar giving a more atmospheric, echoing direction from time to time, it is clear that apart from the impressive skill, the aim was to convey a message. As a whole, “Undying Light” has a very dark tone coming from the screaming guitar effect, really deep drum sound and especially from the vocals. It seems intended to be noisy and aggressive as opposed to melodic, although melodies are present enough for it to make sense musically. It feels odd and out of focus and my best guess is that it was supposed to be that way because lyrically, it impacts on the apathy and negative effects that certain influences have on society (emotional and lyrical content presented in the video below). Especially the “social media” subject was one that I could personally identify and relate to in the lyrics and the toxic, numbing effect that it tends to have when misused is one that I’m very familiar with. The lyrics as well as the vocal delivery put a lot of accent on pain and convey this message under the form of a struggle or a downfall. Although I dislike the vocal style used, with really intense high pitched screaming, I can connect to it and it really makes a lot of sense within the scope of the whole album and concept. And while the music is incredibly powerful and raging, as the record flows, it tends to flatten out into a stale and apathetic atmosphere as a result of the songs sounding very similar. I’m not saying this as a negative because it is the element that allowed them to properly illustrate their intention and when your goal is to express humanity being ever more passive and lethargic, diversity and flamboyance aren’t exactly your “go to” elements. But the album does have its twists and turns to keep a listener satisfied and I have to mention the contrast between “Eyes Like The Sun” and “Distant and Cold” as a really important moment, the first one being the most technical, heavy and intense song on the record while the second is the most out of the pattern, being the slowest, most atmospheric and definitely the most numbing. The ending of the last song “Departure” was also one I found very surprising. With the outro riff getting more and more distorted until it’s degraded to undiscernible noise and then being suddenly cut out. I assume they took a symbolic approach to expressing how disrupted and out of focus society can turn out. It’s a very good way to end the record and probably the most inspired moment. “Undying Light” is certainly a remarkable album that breaks a lot of patterns but I can’t find myself recommending the full stream because just like the negative influences that it describes, it eventually wears you off. If you are in a really dark place I’m sure this album can help you push through but apart from that, the emotion that they deliver isn’t one I find exactly appealing and it can really take its toll on me. I think I’ll just stick to a song or two at a time. But I do find it satisfying and if death metal is your thing you should totally give it a chance. 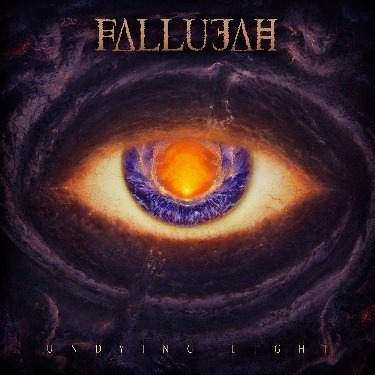 This entry was posted in Bands, Death Metal, Progressive Metal, Reviews and tagged 8.5/10, fallujah, LP, Nuclear Blast Records, progressive death metal, Technical Death Metal, Undying Light, usa.